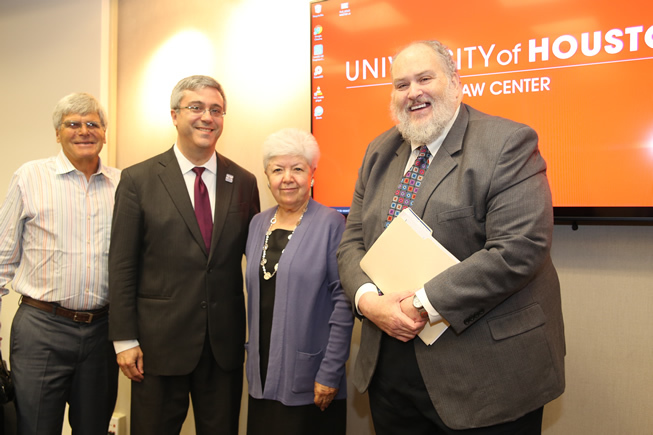 June 27, 2017 — The University of Houston Law Center celebrated the 35th anniversary of the Supreme Court case Plyler v. Doe on Tuesday with a panel discussion hosted by the Institute for Higher Education Law & Governance and the Mexican American Legal Defense and Educational Fund in the Hendricks Heritage Room. The U.S. Supreme Court decided in Plyer v. Doe that no public school district has a basis to deny children access to education based on their immigration status, citing that children have little control over their immigration status, the harm it would inflict on the child and society itself, and equal protection rights under the 14th Amendment. "This was a landmark Supreme Court decision in the history of education law, Latino civil rights, and certainly in the history of MALDEF," said Thomas Saenz, president and general counsel of MALDEF. "We're pleased to be at the Law Center to commemorate this decision which emanated from this very state based upon a law that sought to deprive undocumented children from the right to a free, public education." Saenz then moderated the panel discussion held in the Hendricks Heritage Room that included Vilma Martinez, the former president and general counsel of MALDEF, Peter Roos, the former MALDEF national director of education litigation, and Professor Michael A. Olivas, the William B. Bates Distinguished Chair of Law and director of the Institute for Higher Education Law & Governance at the Law Center. Olivas said he considers Plyler v. Doe the preeminent decision in immigration law, but that it needs support as these issues evolve. "This case is the high-water mark for immigrant rights," Olivas said. "It was courageous and strategic. Winning is one thing, but it's not static. It has to be fought for, it has to be defended, re-conceptualized and re-applied." Attendees received two hours of continuing legal education credit.